The Home of Fretworks, a successful Fretworks business. We handcraft all sorts of marvellous wooden fretwork designs suitable for Edwardian, Federation, Victorian and Californian bungalow houses, and even modern homes where the house renovator or builder wants to add a bit of extra character. 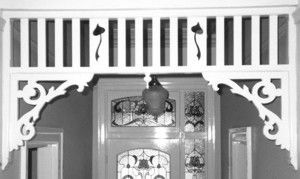 We also supply other decorative timber work, including turned products, corbels, fretwork mantels and fire screens. We offer a full consultation, and clients often spend hours working on designs with us. We have a company albums and magazines to help with ideas. We have dramatically increased our interior fretwork range over the past few years, and many of the hundreds of examples decorate the showroom. While some interior fretwork designs are made to measure, the components for others can be mixed and matched in the showroom. Prices have remained much the same over the past two to three years, with straight spindle pieces selling at $2.50, squiggles selling at $3.50 and inserts going from $15.00 to $58.00. Corner brackets sell at between $16.00 and $150.00 depending on the design and there are now more than 190 corner bracket designs to choose from. We also offer special discounts for laser-cut products, including many of the more intricate interior fretwork designs. The Home of Fretworks is the only firm in Australia specialising in fretwork to this degree. We offer the biggest range, with interstate, trade enquiries welcome. All fretworks are hand made in a wide range of timbers. The Home of Fretworks have designs for various locations in a home; hallways, archways and interior bay windows. Add a touch of style to mantelpieces an Period style furniture. Ideal for Renovators. Choose one of the many fanlight designs to enhance your door opening.